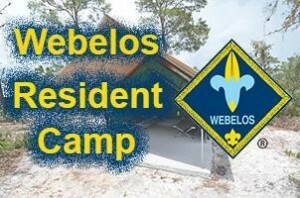 Webelos Resident Camp is a short-term camping experience designed to introduce Webelos 1 & Webelos 2 (after June 1, 2019), their leaders, and their parents to a theme-based, summertime camping experience that will help the Webelos be prepared for a smooth transition into Boy Scouting. It's a memorable 4 days and 3 nights of thrilling and adventurous activities that keep campers excited for months after the closing campfire. Webelos Resident Camp is held at the Camp Long Lake (CLL) in Dundee, WI. Packs must provide adequate leadership for their Scouts, but every Scout does not need a parent to attend. The ratio of youth to adults must be 8 to 2 or less with a minimum of 2 adults . At Webelos Resident Camp, Scouts will participate in a variety of activities, including shooting sports, swimming, fishing, Scout skills, and much more. Many of these activities will help Scouts earn various Webelos activity badges and belt loops. Nights will be campfires, fun and games, and the tranquility of CLL. For leaders, it's a great place to spend quality time with your Scouts without the distractions of everyday life and just get away for a couple of days. Resident Camp is pure fun from the time you get up in the morning until the time you crawl into your sleeping bag weary from the day's exciting adventure.